If you’re going to come to the market with a new platforming adventure, then in order to be a success you really do need to stand out from the crowd. Villa Gorilla and Team17 are trying to do just that with Yoku’s Island Express. And it seems as if they have succeeded in their quest as not only is this a platformer of the very highest quality, but it’s also a pinball experience that shouldn’t be overlooked. And when you combine those two brilliant genres together, add in a huge amount of colour, some great physics, a ton of character, more humour than you can deal with and enough fruit-filled adventure to keep the world revolving, then you’ll just about begin to realise how good Yoku the dung beetle’s tale is. 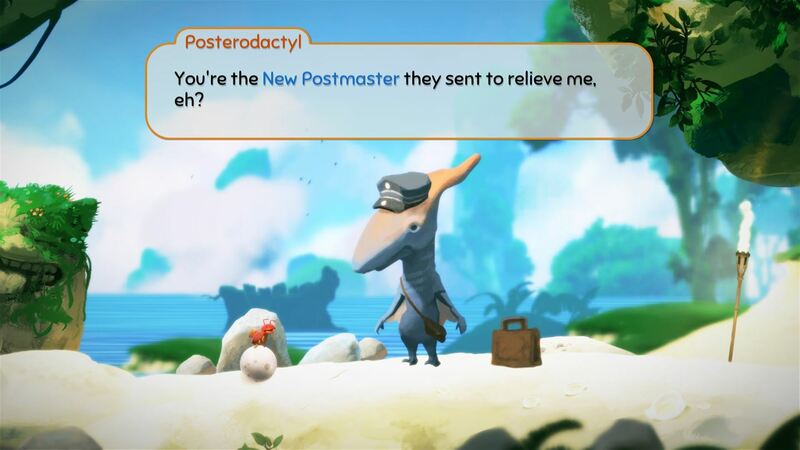 After arriving on Mokumana Island, taking over as postmaster from the retiring Posterodactyl, and preparing to deliver parcels to the residents of a tropical paradise, Yoku was most definitely set for the easy life. But little did he know that an ancient island deity had been trapped in a restless sleep; one that has left the island’s population in need of help. Step forward young Yoku and his ball of dung as he prepares to be pinged and bumped around a stunning world that is full of uniqueness, full of twists and full to the brim with utter enjoyment. In fact from the very first seconds when the utterly brilliant title music kicks in to play, to the last moments in which you finally help Yoku save the world – ah damn, is that a spoiler? – Yoku’s Island Express is a joy to play. Controlling your dung beetle friend across a seamless world that opens up with every step of the way, not only will you be found rolling across the usual platforming fare, actioning quests for various characters, but you’ll also be found posting letters in bright red post boxes and collecting a whole ton of fruit to allow you the chance to unlock the positions of hidden collectibles. With the addition of well placed bumpers – some of which will only work when you deposit enough fruit – and flippers, you’ll be found pinging Yoku around the world to unreachable areas, taking in a number of cleverly created pinball inspired puzzles in the process. But this isn’t just a load of pinball tables dropped together for no real reason and in a definite nod to the likes of Banjo Kazooie and Yooka Laylee, we find Yoku grabbing missions from the various island inhabitants as he tries to uncover the mysteries of Mokumana Island. These mostly consist of travelling to X to then move on to Y, before concluding with Z and being gifted a reward or the chance to take down a boss character. But it all works great and is just as much fun in the latter stages as it is from your first beach landing. The many characters you’ll come across are delightful too, all with good backstories and quests to take on. It would have been nice to see a bit more interaction with these guys though, as aside from your pinball drain coverer, Kickback, it’s hard to find too much love for any of them. This could be put down to the lack of proper voice over for any of the team, and whilst I guess it is hard to voice a parrot, or come up with a unique accent for the many weird and wonderful characters included, doing away with the obvious ‘90s style gibberish speech and text boxes would have been preferred. For all this to come together though and for Yoku to become the grandest of postmasters, the control system which allows Yoku to go about his business needs to be spot on; for the most part Villa Gorilla have nailed this perfectly. The usual thumbsticks help you roll Yoku around the vast world ahead of him, grabbing on to his dung ball and being pushed and pulled forever more. But roll over a blue or yellow bumper, and a quick hit of the triggers will see him and his ball reach previously unobtainable areas, taking a ride on the various pinball channels and chutes that have been integrated into the world. This sees the usual slow pace of our dung beetle friend quickly removed and we are thrust into a frenzied pinball world as he flies between flippers and bumpers until he reaches his destination. There are also numerous spots when a bit of proper pinball action is taken in. Finding yourself trying to navigate the channels of a flipper and bumper filled arena, whilst hitting specific buttons and trying to keep Yoku out of any drain, is very much par for the course. 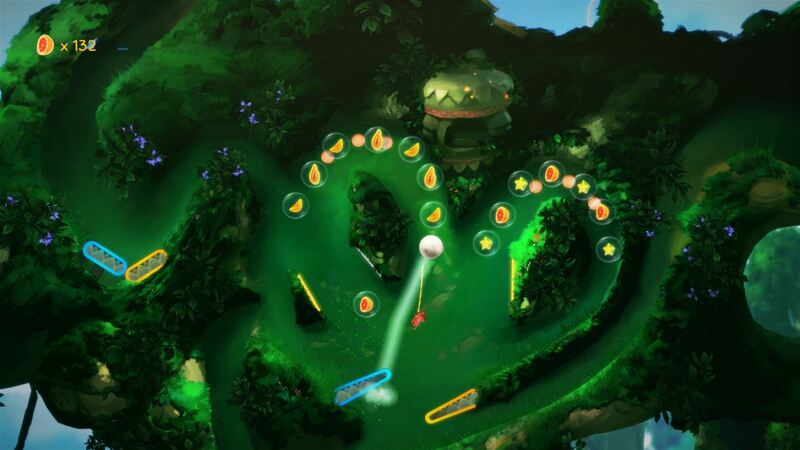 With fruit flying out of every area you hit, explosive slugs helping clear the way of any obstruction and just sheer joy found having Yoku hit from pillar to post, these arenas are the real draw of Yoku’s Island Express, ensuring that any pinball fan has plenty to look forward to. 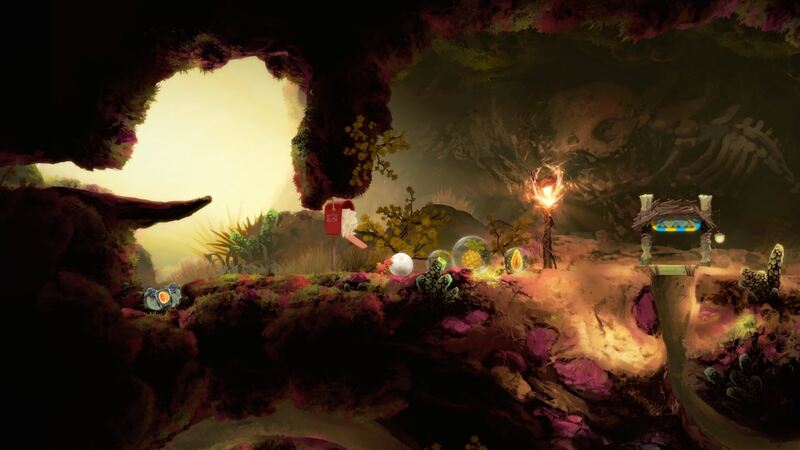 And as you progress, pick up fruit, find hidden areas and complete specific objectives, Yoku will quickly obtain many other abilities too, like being able to swim under the ocean waves to grab previously unobtainable collectibles, and fly through the air by utilising the power of carnivorous plants and ‘Sootlings on a leash’. Needless to say, these lesser mechanics have been designed with as much love and care as those which the whole game is centred around. A delightful hand painted visual style ensures that all of this comes together in a very unique way. 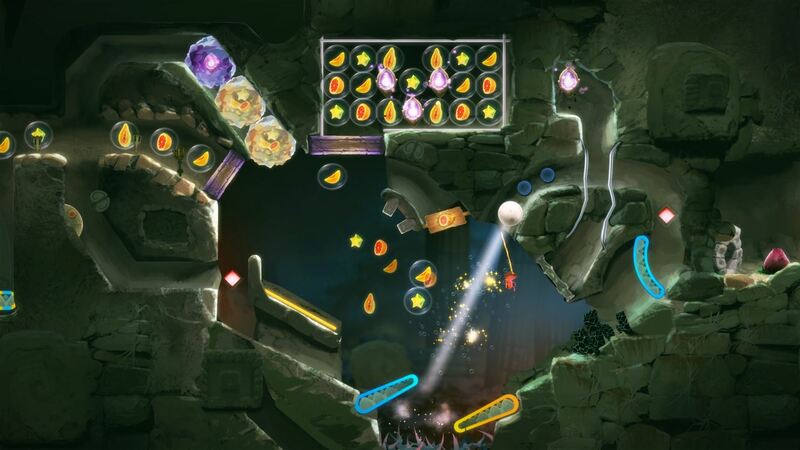 A combination of cutesy design, and well defined, seamlessly integrated world sections alongside that stupidly addictive soundtrack will see that this is a game that will appeal to many a gamer. Even if it is just so you can spend some time blowing a fun little noisemaker to attract attention. As with anything though, there are a couple of issues present and these quite possibly get in the way of making Yoku’s Island Express the perfect pinball-based platformer. Firstly, and there will be times when you find yourself totally lost, left to try and navigate your way around via a mapped overview of the entire island. For the most part, this is all well and good – and without the map, you’d be in serious trouble – but trying to work out exactly how you are supposed to enter certain areas is occasionally more hassle than it is worth. This results in some unwarranted backtracking as you send poor old Yoku back through previously completed complex pinball puzzles for no real reason. The unlockable ‘beeline’ fast travel system helps with this slightly, but this really only comes into its own in the latter stages of the game. A bit of direction in the early stages, accompanied by some world labelling and proper map zoom in the latter part, would be much appreciated. There is also the odd bit of slowdown, resulting in a few seconds of game freeze that completely ruins the entire flow of the pinball wizard design. Granted this happens very rarely – seemingly when fast actioning of the beeline sees Yoku whizzing about the place just as the game tries to autosave – but it is there nevertheless and needs to be pointed out. But other than those two little mishaps, I’ve massively enjoyed my time with this little dung beetle. With the theme music still kicking around in my head now, the world of Mokumana having surprised with multiple twists and turns, and the puzzling pinball moments standing proudly alongside the many platforming opportunities, this is one game that is going to appeal to a huge range of player. In fact, you don’t need to like pinball to like this, and you don’t even need to like platforming. You just need to like gaming in general to be taken aback by everything Yoku’s Island Express delivers. That’s all down to Villa Gorilla and Team17 having the skills to create and develop a platforming pinball adventure that stands out from the crowd. Now, what’s the chances of sending Yoku off to another island and us getting the chance to take in a second tale? Please make it happen as this is one post-delivering dung beetle who is on the verge of gaming stardom.